We got a call yesterday morning, just hours before the start of winter break, from Big Guy’s teacher. She’d wanted to know if he’d been sick the past two days – he had – and if I knew he’d made a present for us at school – I hadn’t. If I could come by and pick up the gift, she’d be there until around 1. When I arrived, she had not only the present he’d made, but also a letter “Santa” had written him and two plastic bags stuffed with parts for crafts the class had made at the holiday party the day before. The holiday party he’d missed even though she’d been prepared for his allergies, calling me from Target well before Thanksgiving as she’d shopped for the goodies for food projects. Big Guy was delighted with the letter, particularly since “Santa” had taken the time to answer questions Big Guy had asked when he’d written Santa as part of a class assignment. 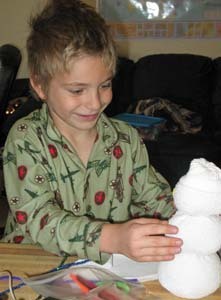 The crafts kept him occupied during the afternoon, and he loved the tube-sock snowman so much that he named it “Teddy.” All truly adored toys in this house go by “Teddy,” even if they’re snowmen. It left me wondering: Where are the bad teachers we hear about all the time from folks convinced that if the unions would go away and every school were a charter our education system would be just dandy. Yes, I know there are bad teachers out there. I even had two or three during my 12 years in public school, but two or three out of dozens is statistically insignificant. Yes, I know there are teachers who are just in it for a paycheck – not that that’s necessarily a bad thing, as long as they’re doing the job. I doubt there are many like that in our school, which is 40 miles smack in the middle of no where. It takes an effort for teachers, unless they’re married to soldiers, to even get here. I doubt they’re going to commit to that kind of commute to show up and phone it in. Yes, there are many things I hate about our schools today, not the least of which are discipline systems that put every infraction on public display and “accountability” that forces 6-year-olds to sit through standardized tests. But bashing every teacher who doesn’t work at a charter school doesn’t solve any of that. Particularly when that bashing is based on outliers and ignores the good work so many people do in so many of our schools on a daily basis. In our combined 8 years in the public school system, we never found a bad teacher. There were situations where the teacher/student fit wasn’t so great, but the kids almost always benefited from the experience to a greater or lesser degree. Of course, run-of-the-mill good teachers don’t inspire media coverage.